Fig. 18-9. Canted Momentum Wheels in the Pitch-Yaw Plane. ht and are the wheel momenta. momentum wheels are nominally operated at thè same speed, such that A, = h2, and the total momentum is along the pitch axis with hy = 0. When the horizon scanners sense a roll angle error, a controlled yaw momentum component is generated by differentially torquing the two wheels to reduce the anticipated yaw error which will occur one-fourth of an orbit later. Because of the large moments of inertia of the SEASAT spacecraft, the scanwheel momentum is augmented by a pitch momentum wheel; a roll reaction wheel is used for roll angle control. The operation of the SEASAT control system is described in detail in Section 18.3. Because the disturbance torques in high Earth orbit are very small (see Section 17.2), it is possible to use small reaction wheels to absorb them with an active control system to maintain three-axis stability. In such a system, gyroscopes are generally used to sense and feed back any body motion to the wheel torque motors on each axis. The torque motors then apply a compensating torque to each reaction wheel, which effectively absorbs the disturbance torques. Thus, the angular momentum vector changes slowly with time, and the attitude remains fixed in inertial space. When the wheels near saturation, the angular momentum is adjusted using gas jets or magnetic coils. Ideally, the attitude is controlled to the same steady-state value during desaturation, although in practice transient attitude errors are induced. A slew, or attitude reorientation maneuver, can be executed using the set of reaction wheels to rotate the body about a commanded axis, usually one of the wheel axes, as described in Section 19.4. As shown in Fig. 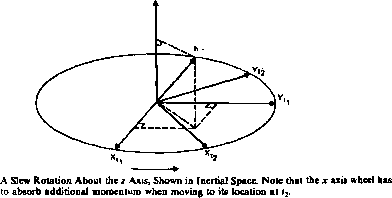 18-10, the angular momentum vector remains inertially fixed, although the attitude angles change as do the angular momentum components in a body-fixed coordinate system. In the example shown, the x axis wheel might approach saturation at the final attitude just to absorb the larger momentum component. Note that in addition to estimating the attitude, it is also necessary to keep track of the wheel momenta for calculating momentum dumping commands and slew execution times. maneuvers without fuel consumption, and (3) compensation for cyclic torques without fuel consumption. This system, however, generally requires an onboard computer to implement the control laws and achieve the target attitudes. where Nc is the control torque vector in body coordinates, the vector (1,-1, — 1,1)T represents the specific wheel geometry along the diagonals of the octants with positive x, and k is an arbitrary scalar which signifies the one remaining degree of freedom. The scalar, k, can be used to achieve a desired reaction wheel momentum distribution. If k is set to zero, the steering law (Eq. (18-42)) will minimize the norm of the wheel torques. If a wheel fails or is disabled, the scalar, k, can be chosen to null the failed component of the wheel torque vector, N, and thus avoid storing several different forms of the distribution matrix A R.
Section 15.3 outlined two fiàsÎÈMçchniques for attitude control. Open-loop control utilizes groundPbased software and analysis to determine the attitude and compute and uplink commands to àn onboard torquing system. Open-loop control may either maintain the spacecraft at a given orientation, which we define as stabilization, or maneuver the spacecraft to a new attitude, as discussed in Chapter 19. Thus, open-loop stabilization and maneuvers differ principally in the arc length separating the actual and the desired attitude. In contrast, closed-loop control uses attitude errors measured by sensors to automatically activate torquing devices via an onboard computer or analog electronics and thereby maintain thé attitude errors within specified limits. For missions such as the planned Space Telescope, pointing requirements may be as stringent as 0.01 arc-second [Elson, 1977]. However, most current autonomous spacecraft have much more modest requirements, in the range 0.2 to 1 deg. In this section, we describe the characteristics of and design considerations for several typical autonomous control systems. Two basic configurations are discussed: inertially referenced spacecraft which maintain a nearly fixed attitude relative to a stellar target and Earth-referenced spacecraft which maintain a nearly fixed attitude relative to the nadir and orbit normal. The inertia! rotation rate of Earth-referenced spacecraft varies from 4 deg/minute for near-Earth satellites to 15 deg/hour for geosynchronous satellites. The first High Energy Astronomy Observatory (HEAO-I) operated during the early mission in a celestial point mode in which the body Z axis was pointed to and maintained within 1 deg of an inertial target while the spin rate about the Z axis was maintained within 10% of 0.18 deg/sec. A computed attitude reference was propagated onboard using a set of gyros (see Section 17.1) and periodically updated via ground-based command software utilizing star tracker data. The HEAO-I control logic, implemented via an onboard computer (see Section 6.9), compares the target and observed attitude and issues a corrective thruster command when an error signal based on the attitude and attitude rate errors exceeds a preselected value.